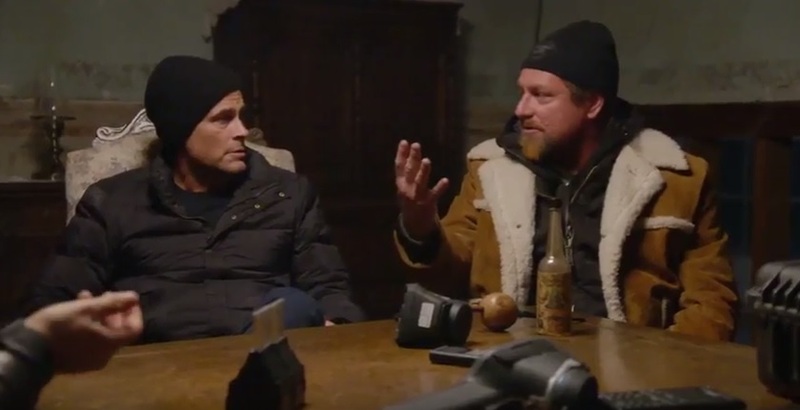 Working with my friend Rob Lowe and his family on their new TV Series The Lowe Files was both a lot of fun, and also a great opportunity to once again answer the shamanic call to show up wherever I’m asked. As you watch each of the Episodes from our first at Preston Castle to the last with “wood apes” in the Ozarks, beneath the rich entertainment and intrigue you will find some profound new experiences and truths about nature and the mysterious paranormal. First, it’s important for me to emphasize the entire show was completely unscripted and spontaneous. I was involved in much of the process from beginning to end and can tell you that all the stuff that happens is real and in the moment, and just as many amazing incidents didn’t make it into the episodes as did, just because of time constraints. Rob’s whole point was to be honest in discovering right along with the viewer what could be experienced as real, and what could be debunked – nothing to hide, and nothing to add. My shamanic work and efforts in the series were every bit as serious and sincere as my clinical off-TV sessions. I was there to facilitate healing, enlightenment, wisdom, “pushing the envelope” vision and ideas, protection, and of course fun and humor – just as my Q’ero shaman teachers do. So what’s great is that the show is not only super entertaining, but it’s also really deep and profound. I think you’ll pick up on that in most of the episodes, but I thought it would be great to share some of the takeaways or lessons that could be gleaned on the deeper levels from my shamanic point of view. So here goes. Insight 1: The non-physical world of spirits, or souls that have died but are stuck between the worlds is every bit as complex as the physical world. In the Preston Castle episode, it was clear that the trapped souls of the children and young men that were haunting the place where still following the daily routine of waking, bathing, meals, playing, tormenting, etc. and still had much of the same personality traits as when they were alive in the physical world. One of the first souls that asked for my “cleansing medicine” was one that had murdered Anne Corbin. In shamanism we say that the “perpetrator” is in more pain than the “victim”. So while Anne’s soul had already been healed and moved on, the guilt-ridden and tortured soul of her murderer had not. After I performed the healing that soul said “thanks”, and then we were led to do more healing for a soul that led us outside. Also, some footage that we captured as soon as we walked into the castle included a number of spirits responding to us and in some pretty playful and profound ways regarding all of the people and personal dynamics in our group. And in that footage we can see the small orbs of their consciousness darting in and out and all around us. Insight 2: The personal preferences and beliefs that we hold in this physical world carry over to the non-physical world with us when we pass – at least in the early stages of our journey beyond death. The soul that carefully led us outside and gave us his name and certain details of the death, as we realized the next day from the local historian, answered a very important question for me as I began my healing ceremony on him. At the time, I knew that souls in the area could be a combination of Miwok native descent, could be workers at the Castle, or could be the inmates. And I knew that my shamanic approach is a kind of over-arching or foundational generic methodology that works anywhere. But, in my sessions with physical clients, I can also work completely within their religious or spiritual traditions and beliefs and have the results just as effectively. So, when we were led to the spot that you see in the episode where the healing was to take place, in my head I was wondering if the soul would prefer a Christian, Miwok, or Shamanic approach, and at that moment the word Bible came over the Ovilus device that allows spirits to speak through. I had my answer and proceeded with a Christian-based healing prayer. Insight 3: Sometimes you go into a healing ritual with a particular intent or speculation about what needs to be done and for whom, and Spirit corrects you and leads into another situation all together. As a shaman we must become very comfortable with this concept of the unknown and unknowable no matter how experienced, smart, or capable we may be. This happens in the series a few times, and I don’t want to give away anything from the yet-to-be-aired episodes, but in the Preston Castle episode, we learned that some spirits just didn’t want to take part. And of course, the previously mentioned surprise of having the murderer ask for healing was another example. Then, something that didn’t make it on screen, was that a spirit directed a couple of members of the local crew that were following us around to reconcile and heal some differences that had in the past, that none of us were aware of. That was an amazing moment of hugs and tears as we and the two deciphered the names and story that the spirit was communicating to all of us through the Ovilus device. Also during the Alien Abduction episode, although the intent of the fire ceremony ritual was to try to communicate with our star brothers and sisters, it ended up also being an initiation rite of passage for John Owen, Mathew, and Rob. It could be that some time down the road, the original intent of connecting to “aliens” will manifest for them in one way or another. This is true for all shamanic work in general, and particularly when trying to get something to happen on que in a 20-minute time slot! Insight 4: Negative energies and spirits can only get to you where you are getting yourself already. When we put ourselves into situations in the series that involved particularly dark or malicious souls or entities, no matter how much protection that I placed around everyone, there were a couple of instances where some of us would not feel very well after the shoot. When I explored further, inevitably and true to my regular client and personal work, there was usually an affinity of sorts within those of us affected to the energy that was getting to us. For example in the episode filmed in a prison, it was natural as we heard about and reflected on the lives and crimes of the prisoners involved, as well as the sometime overly harsh punishment involved to think about our own mistakes, regrets, and sometimes punitive judgments towards others. When we have any self-judgment, doubt, or questioning, we create an opening in any protective field and in our own soul that provides an entry point for malicious energy to take hold and drive us further in that direction. It’s common for just about everyone to have some of that going on, and therefore a common practice of mine to have to kick out the energy and try to close the affinity by helping the client to forgive and embrace themselves completely. And effective shamanic method for this after all of the other healing steps is called “shadow” work. Insight 5: Being psychic, hyper-sensitive or empathic is less about picking-up or reading information, visions, or feelings from other people, places or times, and more about creating a vision that can influence an outcome in a positive way. Early-on in meeting Rob and his boys, Matthew, and John Owen, I recognized and shared with them their extraordinary shamanic visionary gifts of both tracking and manifesting. Of course most people, including myself when first hearing something like that, pretty well reject it off-hand. This can be out of true humility, and also out of reluctance to embrace such a gift because of the stigma of responsibility that has been placed around it. What I do love about all that happened in the filming of this series with the family, is that for those with “eyes to see”, you will recognize their gifts as they also get proof of them as well, particularly in the Remote Viewing episode. And discovering and owning those gifts is less than half the battle. What I have experienced personally and with some clients, students, and friends like Rob , is that when you get good at creating, articulating, and feeling a vision that you formulate first within your own mind, body, and soul, is that it will then manifest into the physical world. That is the true work of the visionary and the Empath: Track or read for just a moment what is, then decide if you would like it to change it, and hold the vision in its place for what could be instead. I look forward to sharing more with you as The Lowe Files continues and as new insights come into view. Feel free to email me with questions and follow me on Facebook, Instagram, and Twitter.